Denon introduces 'entry-class' Blu-ray player at £400 | What Hi-Fi? Still, Denon hopes its Profile 2.0 DBP-1610 will have the spec and performance to justify its price. It supports Dolby TrueHD and DTS-HD Master Audio, Deep Colour, x.v.colour, and 1080p/24fps video. There's 1080p video upscaling for standard-definition sources such as DVD, an Ethernet connection for hooking up to the internet and accessing BD-Live content on Blu-ray discs, plus DiVX HD playback and support for AVCHD video recorded on HD camcorders. One area where Denon has paid particular attention is that of stereo playback for music. 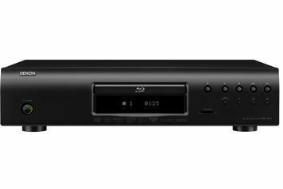 With an eye on those who wish to use their BD player as a step-up CD player, the DBP-1610 is equipped with a pure direct mode, dedicated stereo analogue output and high-quality Burr-Brown digital-to-analogue converters. The Denon DBP-1610 will be available in black from October, and we'll be testing it soon.